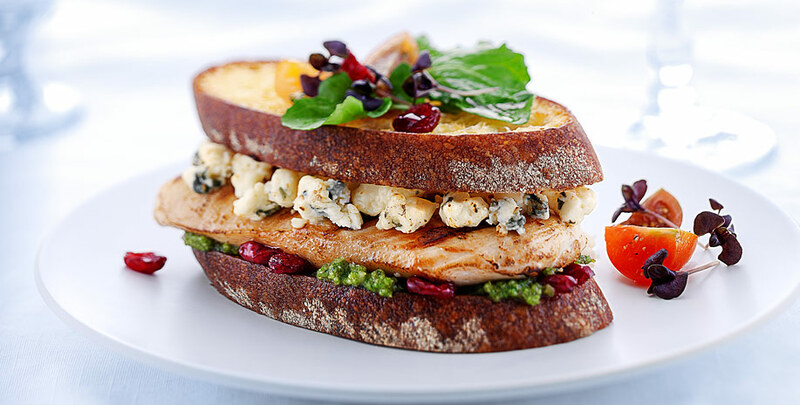 This grilled cheese has Wisconsin Gorgonzola Blue Cheese , Wisconsin Parmesan along with grilled chicken breast, and arugula smothered in argula walnut pesto. M Recipe courtesy of Wisconsin Cheese. Make pesto; Place walnuts, garlic, Parmesan, and arugula in a food processor or blender and pulse to chop. Heat grill over medium- high heat. Season chicken breasts with salt and pepper. Grill for about 5 minutes per side. Reserve on a plate. Butter one side of each ciabatta slice. Place 4 slices butter side down in the pan and top each with 1 tbs of pesto, 1/4 cup dried cranberries, chicken breast and 2 ozs of Gorgonzola. top each with another tbs of pesto and ciabatta slice, butter side up. Grill until golden on both sides, turning sandwiches once during grilling.